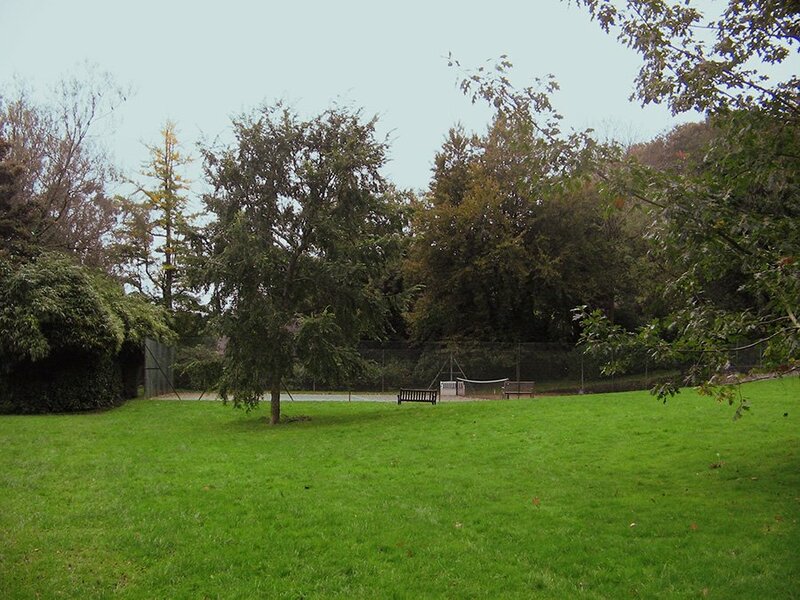 This level area of grassland lies parallel and to the west of Fore St, separated from the back gardens of houses by Parson`s Brook and contains the playing field and play areas. Historically this was an area of marshland where villagers kept geese and other livestock, and the brook was little better than an open sewer! Following the draining of the marshland when the land level was raised with spoil from the widening of AG Hill this area became an important amenity for the village. In the 1960’s the area was registered as common land and the field has recently been granted a Fields in Trust status which will help secure the future preservation of the area for the community. Generations have played football on the football pitch, and school sports days on the green have been a highlight of the end of the summer term for many years.Guy Fawkes day is celebrated annually with a bonfire and fireworks on the green. Over recent years the green has been the venue for the Aveton Gifford Vintage Car Show on August Bank Holiday. The villagers of all ages use the green to walk their dogs, a quiet area away from the roads. At the southern end of the green, by the Fisherman`s Rest a subway under the bypass gives access to Timber`s carpark, the river Avon and the tidal road. The community has benefited from the recent building of two new Play Parks at the northern end of the green. 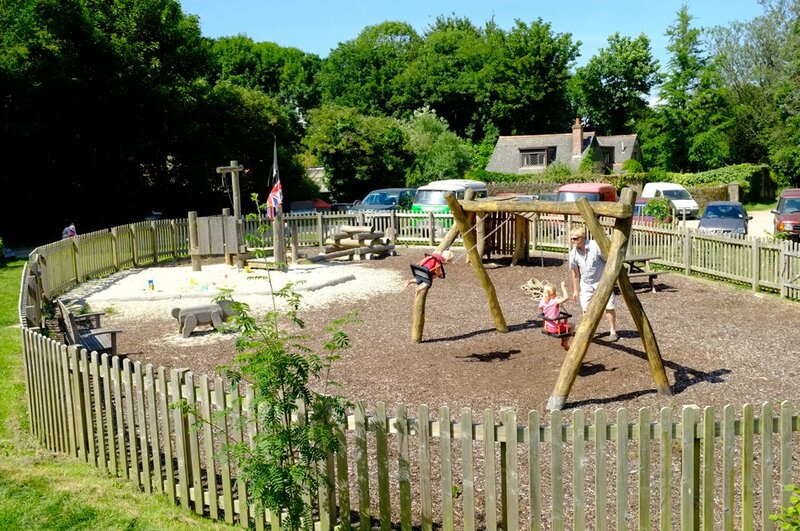 One is designed for the use of the preschool children and includes swings, a sandpit and a `Wendy house` This provides a safe secure area where small children can play and parents can relax. The recently completed Play Park suitable for older children has been possible due to a substantial National Lottery Fund grant. 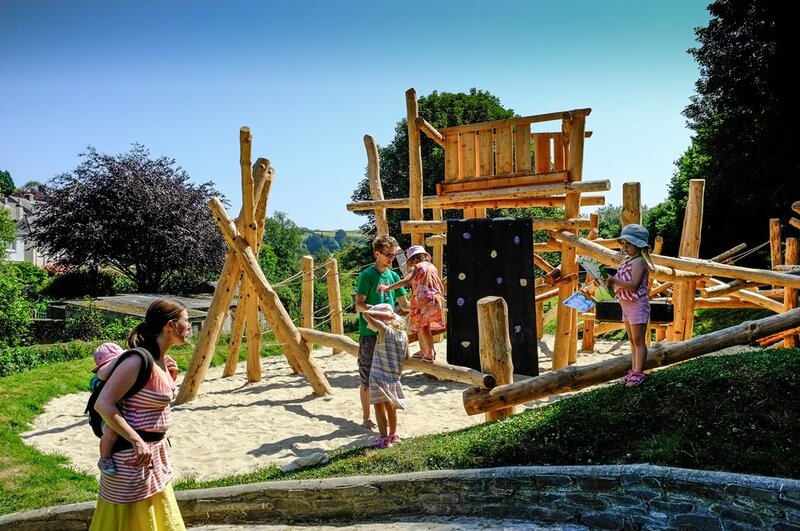 The eye catching wooden structure provides challenge and excitement for the older children and young people. A third play park is situated below Icy Park and provides a range of equipment for younger children. The Rectory lawn lies at the northern end of the village behind the village Hall, it is a pleasant gently sloping area of grass, planted with specimen trees. This area is leased by the parish from the Diocese of Exeter and was formerly part of the rectory garden. Parsons brook runs along the lower border of the lawn separating it from the village Hall. 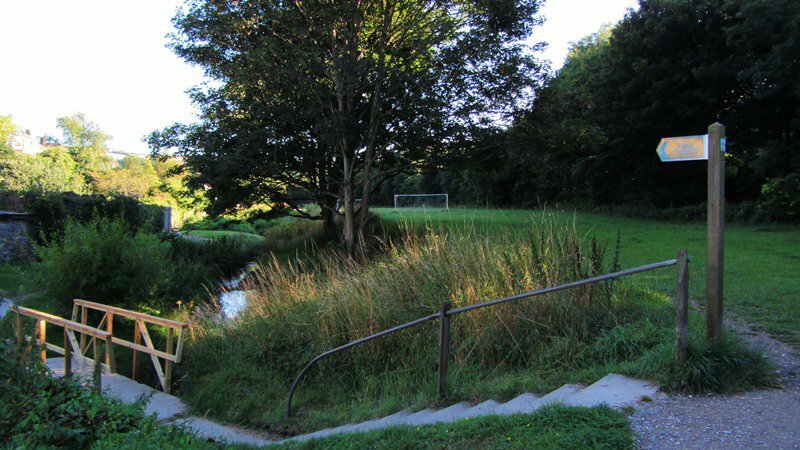 The brook here is easily accessible and children enjoy leaping across it or looking for small fish. The lawn is the centre of many important events including the annual church fete and in past years a music festival. A hard tennis court was constructed in 1984 at the southern edge of the lawn. The Churchill Chestnut, the fine horse chestnut tree on the hall side of the stream was planted by the vicar Rev Cuthbert Shaw in memory of Sir Winston Churchill who died in 1965. The marsh is situated on the southern bank of the river Avon at Bridge End, and is approached by the lane which leads to South Efford House. 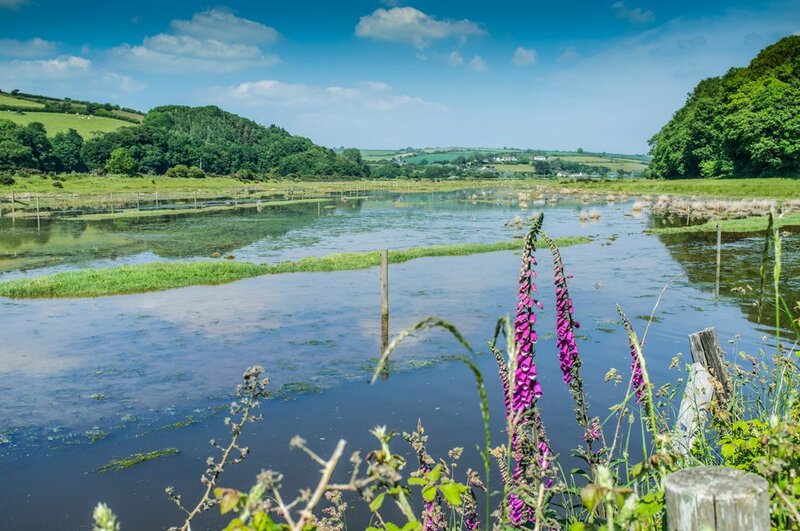 This area of grazing marsh was purchased by the Environment Agency in 2010, and is now designated as a Devon Wildlife Trust Nature Reserve. Banks were built many years ago to keep out tidal water so that the area could be used as grazing ground. The marsh has now been returned to become a tidal salt marsh with the use of a unique tidal gate. The intention is to provide an environment to attract wading birds and salt marsh plants. The changes are being monitored closely and the early reports are encouraging. It is hoped that this reserve will be used as an educational resource and, provide an amenity for the community. The building of a bird hide is planned. Parking is limited at the entrance to the marsh, but parking is available at Timbers Car park. Care must be taken when walking across the bridge ! Dog walkers are always welcome here, but may we please politely ask that you clear up after your dog when necessary, as dog poo can sometimes be a problem, and is particularly unpleasant for those maintaining the grass, and keeping our public areas clean. There are dog poo bins at either end of the village green, and another by the bridge over the stream on the Rectory Lawn, and emergency dog waste bags are also available in the same places. However South Hams District Council now permit dog waste bags to be disposed of in all the ordinary green bins throughout the village, as these are all emptied regularly. These bins can also be found in the car parks, by the shop, in Fore St and Icy Park, so it is always easy to reach somewhere convenient to dump the waste. With many thanks for your help in keeping our public spaces clear, and pleasant to visit.